Picture/track synchronization is usually pretty important. Even when a film doesn’t have actual recorded lip-sync dialogue, most films have a correct sync in their finished form, and obviously it’s an important thing for a preservationist to maintain and be observant of. There’s a ton I could write about synching and sync problems, individual examples of weird or variable synchronization, or just the different ways we deal with sound sync in general, but for the time being, I’ll give this example, which is slightly atypical (at least in the world of experimental film – I have a feeling some TV archivists have seen this plenty of times!). Many of you reading this probably know that usually, in film, sound and image are not only recorded separately, but also usually printed from separate picture and sound elements – these days, typically a picture negative and a track negative. In the printing process, the picture element and the soundtrack element will usually have sync marks and/or hole punches at one or both ends of each which are used to match the separate picture and track rolls to the same printer start point, thus resulting in a new print with correct sound synchronization. In some cases, a film may have been shot on a camera capable of exposing an optical soundtrack directly onto the original (classic example being an Auricon camera, which Warhol famously used extensively), yielding an original with synchronized optical track already on it. Or an intermediate printing element may have been created composite, with the soundtrack built into it. This latter situation could be for a few reasons, such as a dupe negative struck directly from a composite print (due to lack of an available original, for example), yielding a dupe which has the soundtrack built into it. Kinescope negatives also are frequently composite – more on that below. Though a composite negative could technically be made in black and white or color, a color internegative with a latent track (as it’s sometimes called) is not likely to yield a great sounding track (color negative stock itself not generally being capable of producing a high quality optical soundtrack). Even a b/w dupe negative, though much more capable of producing a good soundtrack, may achieve mixed results depending on the source and quality of the track, as well as how it’s printed. For example, if you have a b/w composite negative (i.e. picture and track are married in the negative), you could either print it in one pass through the printer or two. Printing in one pass would mean exposing the negative — including the track area — when making the print, to yield a new print in which the picture and track were exposed in the same single pass through the printer. Though you can get perfectly decent results doing this, it creates some limitations. One limitation is that since a decent sounding optical track is dependent on a consistent exposure throughout its length, you ideally don’t want to make any timing/density changes to the picture, because any changes of that nature would also affect the track, as it’s being printed simultaneously with picture. Conversely, the ideal consistent density at which the track should be printed for highest possibly quality might not be at all ideal for the look of the picture. So a better option — albeit one that would probably cost a little more at the lab — would be to print the negative in two passes: one for picture, rewind it back, then another for sound. This way, though the negative is composite, it can be treated as if it were two separate elements, one picture, one sound, and the respective passes through the printer can be optimized for each. So the track can be analyzed to print at its optimal density while the picture can be treated in whatever way it needs to look as correct as possible, even including multiple density changes if needed. As you can imagine, when printing a composite negative in two passes, or, for that matter, when printing separate picture and track negatives too, one possibility is ending up with a print out of sync. This can happen for a few reasons, and of course it could be a lab error, or an error due to incorrect setup of the elements. I was working on Robert Nelson and William Allan’s 1968 film War is Hell a few years ago. This film was finished as a videotape broadcast on KQED in San Francisco, from which a kinescope negative was then made. Kinescopes are basically film records of video/television broadcast common in the 1960s and earlier, in order to create a more permanent and/or distributable version of a videotape or broadcast, or even to record a copy of a live broadcast, particularly in the early days of television before videotape could be employed to make recordings. A lot of early examples of live television survive today because of kinescopes that were made at the time. In 1968, Nelson and Allan were commissioned to make this piece, shooting it in black and white, partly on 16mm (exteriors), partly on video (interiors), mixing the two in the television studio to create the final edited videotape. This tape was broadcast, but a kinescope negative was also created, and Nelson used it to make 16mm prints of the film, which were then distributed through Canyon Cinema. It’s quite common for kinescope negatives to be composite, with picture and track married on the same roll, and this was indeed the case with War is Hell. So as the original negative for this film, the first preservation step was to make a new answer print. I decided this should be done in two passes, because in addition to working out the ideal timing/density for picture, I wanted to have as good a print of the soundtrack as possible, so it could then be used as a transfer source for sound restoration. So the lab produced a new print in two passes, to optimize the quality of the printed soundtrack. Not wanting to risk dirtying the print in a projector, I just gave it a very quick bench inspection and then just sent it to Audio Mechanics in Burbank to transfer the audio, then to a transfer house to make a basic video transfer that we could use to check the sound against a video picture reference. In the above picture, the original kinescope negative is on top, and the new print underneath. They are lined up exactly against each other picture-wise. 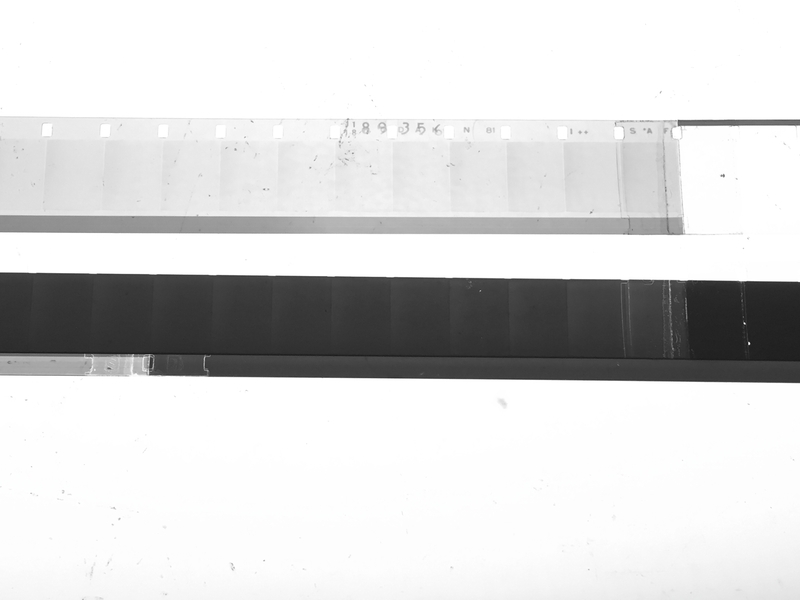 Notice the position of the full tape splice in the negative (at the cut from clear to grey at the extreme right) compared to its position in the print – the printed-through image of the tape splice is split in two: the picture part of it matches the negative, but the soundtrack part of it is way off to the left. This is the same splice, but the lab accidentally printed the picture and track 9 frames off from each other, so the track in the new print is actually 9 frames late, which is quite a bit! Luckily, the nature of the film and this element made it easy to spot the error, but it was definitely an unexpected one, given the seeming ease with which a composite negative should be printable in sync. But it definitely goes to show that plenty of unexpected stuff can happen, even with what seems like a fairly standard step.